Disclaimer time! I won this in a contest on TroveLive on Vapers.TV. This in no way alters my opinions or influences my review. Taste is subjective, and you may not agree with my opinions. That's OK... they're just my opinions. I won the complete line of Boosted eJuice about 7 days ago. I received it about 4 days ago. Folks, that is lightning fast shipping! And, for a win, no less. I've always leaned towards savory flavors. I like Chai and Coffee. I've avoided fruity flavors. All of the Boosted line is made with fruity flavors, so I knew, from the start, that this was going to be a different review. I said two-ish and my numbered list does not include an -ish function. The -ish is the font used. On three of the four bottles, it's no problem to figure it out, but on B.O.V., I had to go to the website (where the image is not the same as the bottle I received) and decide by process of elimination which flavor it was. The fonts used are reminiscent of graffiti and very cool - when it can be read. The line I received consisted of Wastegate, Boosted, B.O.V., and Anti-Lag. From left to right - B.O.V., Anti-Lag, Boosted, and Wastegate. Note the shininess of the labels. Boosted - This is the original Boosted E-Juice flavor. Some say it taste like a strawberry milkshake. However, it's constantly becoming known for changing flavor. Anti-Lag - Anti-lag is known to have notes of blueberry, strawberry and watermelon mixed with whip cream and other surprises to fool your taste buds. B.O.V. - B.O.V is one of the top fruit flavors on the market today! Some say it's flavor profile consist of a tropical fruit medley. Containing twelve flavors and may change on you every time. Wastegate - Raspberry cheesecake, vanilla ice cream with fresh raspberries and raspberry puree! Not included was the seasonal Rear Diff which is supposed to taste like Pumpkin Spice Latte. I opened the review by saying that I had always avoided fruity flavors, so it's possible people might assume I don't like these. They would be wrong - dead wrong! Not only do I like them, I'm considering rearranging my vape budget to allow these premium e-juices to stay in my rotation. The flavor descriptions are a little nebulous and they don't want to be too terribly boxed in, and that's OK because the flavors are hard to describe and do change from one device to the next. I tested these in an EHPro LB dripper with a quad coil .6 ohm build wicked with organic cotton (balls), in a 2.7 ohm cartomizer, in an Aspire Nautilus with a 1.8 ohm dual coil, and in my Stepdot's mini-clearos on her Smokeless Image Volt kit. Of the three, the only one I did not immediately put on my must buy more list was the B.O.V. I suppose it might have been the unreadable label that put me of, but I think it was actually the muddier tropical fruit flavors. There was just too much. Second from the bottom of my list was the Anti-lag. Again, I think that there were too many flavors and they competed a bit. I still like it, but its bottle is draining less quickly. All are made with a 60/40 vg/pg blend, so the vapor is decent. These are all 6 mg nic, so the throat hit is acceptably mild even on that quad coil build (although I did choke myself once). The scents from the bottle are very sweet, too. Good enough to drink, but the warning label tells me not to. Will I buy some when I run out? That's a no-brainer. Well, not really a no-brainer as I have to engage my brain a little to figure out how I'll squeeze this juice into my vape budget. At $20 for 30 ml, this ain't the cheapest juice I've vaped, but it's worth it! At present, these juices are available at Giant Vapes and 3D Vapor. Packaging - 9/10 All the info, some even in duplicate, with childproof caps in glass bottles with just a tiny problem with glare and font choice. Scent - 10/10 Sweet and drinkable, but don't! Taste - 9/10 If this review were for just one of the juices, I would have to give either an 8 or 10 out of 10 depending on the specific juice. As it is, I give the complete line a 9. Vapor - 10/10 It clouds up nicely, and smelss nearly as sweet as it down in liquid form. Notes: There are two anecdotes to reinforce this review. 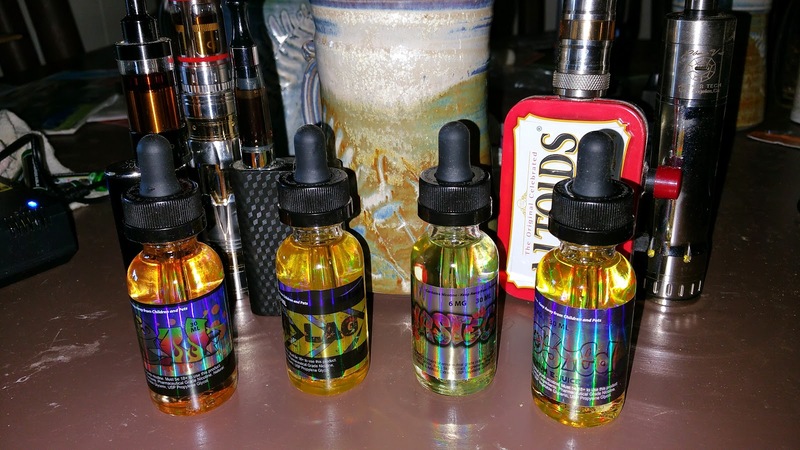 My Stepdot tried it on my dripper and liked it so much, she cleaned out four 10 ml bottles and stole one bottle each. She agrees that the B.O.V. is a little muddied, as is the Anti-Lag. The other story is from interactions with my wife who came home, gave me a kiss and remarked "It's so nice to be able to kiss you and have taste like strawberries instead of burnt tobacco." I had not even told her was I was vaping... even she got the strawberries from the taste. Awesome! Do you know if it contains Diacetyl? Gizmodo just released an article and if it has that stuff in it I will need to switch ASAP. They've published a lab study to set your mind at ease. I located it on Boosted Facebook page (https://www.facebook.com/groups/BoostedEjuice/search/?query=diacetyl). However, the Gizmodo article you're referencing is working with data from more than a year ago. It is largely a scare tactic and has been debunked. Further, most large e-juice companies have removed and/or tested their offerings to ensure that they are Diacetyl free.